Chicken is so versatile, delicious in this recipe but also great stuffed with a filling of cream cheese and sun dried tomatoes or black pudding. Wash the rooster potatoes and cut into chunky wedges. Drizzle with 1 tablespoon of cooking oil and about ½ a teaspoon of black pepper. Mix them all together in a bowl and place on a baking tray lined with parchment. Bake for 35-40 minutes until crispy and well cooked through to the centre. Mix the garlic, butter and chopped parsley together. Now split the chicken fillets with a sharp knife, rub garlic butter between the fillets and fold back to their original shape. Place the chicken on a baking tray lined with parchment and bake in the oven (180*deg;C/350°F/Gas Mark 4) for approximately 30-35 minutes or until the chicken is cooked thoroughly. For the corn, plunge the cobs into a pot of boiling salted water. Cook for anywhere between 3 to 9 minutes, depending on preference. I like mine done for about 6 minutes. Strain off the water and cut each cob in two. Rub in the butter and season with salt and pepper. 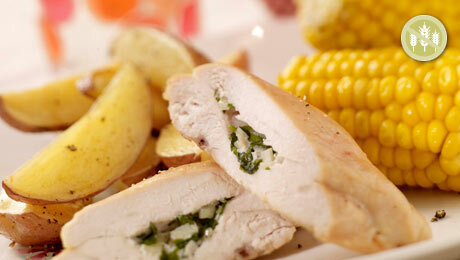 Serve the chicken and corn on the cob on a warmed plate and serve the wedges on the side in separate bowls.